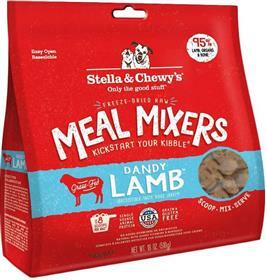 Kickstart your canine’s kibble with Stella & Chewy's Freeze-Dried Raw Dandy Lamb Meal Mixers Dog Food Toppers! Made from 95% grass fed lamb, organs and bone, this protein packed topper is the perfect way to boost your pet’s bowl. Each portion contains 100% certified-organic fruits and vegetables designed to create an optimal and balanced dish that will add all the benefits of a raw diet to your dog’s meal, including a hearty appetite, strong immune system, brilliant skin and coat and increased vitality. Based on the philosophy that pets thrive on the same diet they would consume in the wild, Stella & Chewy’s makes it easy to give your dog what they crave. Ingredients: Lamb, Lamb Spleen, Lamb Liver, Lamb Heart, Lamb Kidney, Lamb Bone, Pumpkin Seed, Organic Cranberries, Organic Spinach, Organic Broccoli, Organic Beets, Organic Carrots, Organic Squash, Organic Apples, Organic Blueberries, Potassium Chloride, Choline Chloride, Dried Kelp, Sodium Phosphate Monobasic, Tocopherols (Preservative), Dried Pediococcus Acidilactici Fermentation Product, Dried Lactobacillus Acidophilus Fermentation Product, Dried Bifidobacterium Longum Fermentation Product, Zinc Proteinate, Iron Proteinate, Taurine, Calcium Carbonate, Vitamin E Supplement, Thiamin Mononitrate, Copper Proteinate, Manganese Proteinate, Sodium Selenite, Niacin Supplement , D-Calcium Pantothenate, Riboflavin Supplement, Vitamin A Supplement, Vitamin D3 Supplement, Vitamin B12 Supplement, Pyridoxine Hydrochloride, Folic Acid.